Bird is a very favorable pet. Not only it can be a good companion during alone time, some birds also produce sounds that make your house livelier. Moreover, bird does not always need to be free like any other pet since you can still enjoy their company when they are still inside cage. It is slightly different from chicken. One of most adopted pet bird is cockatiel. Cockatiel is the smaller version of parrot. However, it does not interact as fluently as a parrot. Generally likable, there still some disadvantages of keeping cockatiels as your pet. Below are some disadvantages you will find as you keep it as a pet. Even though cockatiel has relatively shorter life span compared to parrot, when it comes to other birds, cockatiels live a long-lasting life with life span ranging from 15 to 20 years, while bird in general usually last for 3 to 8 years. On the other hand, it will keep you company for longer time, however, it also means you will need more budget and dedication longer than other birds’ owners. Furthermore, only young cockatiels have the fullest potential, thus, preparing long-term budget is inevitable if you want to develop the bird for your amusement. Make sure you are prepared for it. On the bright side, cockatiel less chattiness is good for avoiding noisy neighborhood. However, it also means you will not be able to interact as much as parrot or African the bird paradise. Cockatiels do have the knack on mimicking voice and carry tunes, yet, it is not the one who will answer your question or asking you to go outside. In general, cockatiel is still a bird that shows emotion through action. If you are lonely at home, you cannot expect to have flowing conversation with it. Despite the fact that the bird does not talk as much as parrot, if it is agitated or in foul mood, it lets out high-pitched scream that make you ears ring. The high-pitched scream comes in long shrill that you cannot just shut it up easily. Moreover, if it is very upset, the duration of the scream can be very long. This is why an owner should not upset cockatiel unless you are prepared for this deafening scream. Make sure your cockatiel is always in a good mood to avoid it. Taking care of cockatiel may need a lot of dedication especially for beginners who are not used to cockatiel’s habit. It has more businesses more than other birds by taking a leak a lot. With this habit, it means the owner needs to clean up the mess more often. It seems cockatiel has fast metabolism going on inside its body that helps to maintain its petite size. As a result, you will find the cage gets dirtier more often than any other bird due to piss and feces. Worse, the smell may spread in your house and ruin your appetite and drive your guest out. Knowing bird’s tendency is important just like you can get closer to bird like eagle or African bird. If you stuck in your finger with a ring on it, you can taste the bite of a cockatiel, especially one that is not yet trained well. Its sensitivity to jewelry is due to the fact that it loves shiny things. In the beginning, a cockatiel finds it difficult to differentiate between jewelry that is not separated with human body. The worst case is when a wild cockatiel starts attacking someone with flashy jewelries. Even though it does not happen too often since cockatiel does not really have hostile personality, it can be bothersome for those who try to train a wild cockatiel. For other birds, you may also need to learn their behavior such as what you have to know about cockatoo. Cockatiel has the knack to mimic a sound with perfect tune which brings amusement to its owner. In fact, many adopters choose cockatiel as the more amiable version of parrot. However, it does not give feedback and only mimic a sound. Thus, you can hear a cockatiel repeating the same line over and over. This repetitive line can be annoying at times. Especially if the cockatiel repeats a word that is not really relevant and it does it at the time when you are busy at home. Instead of entertaining, the cockatiel’s repetitive line will be a source of nuisance to you instead. There actually are not a lot of disadvantages of keeping cockatiel as your pet as this bird is generally friendly once you are able to train it. To avoid having the disadvantages take away the advantages, you may need some tips to train your cockatiel. These tips will help to eliminate some disadvantages mentioned above. Help to train your cockatiel to take a leak in the right place by placing small little box inside the cage. If it is not possible, choose a cage that is easy to clean. 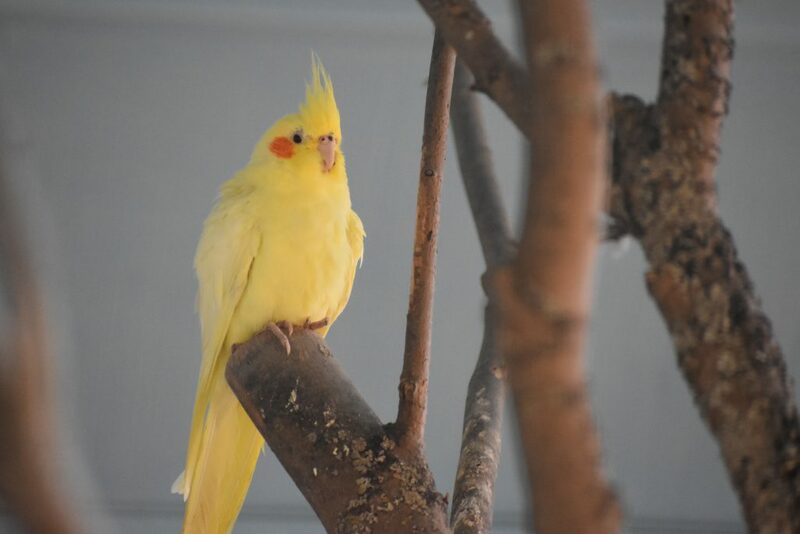 A new, wild animal like new cockatiel will find it difficult to adapt to human setting. Thus, it leads to frantic behavior. To tame it well, invest some time when you can spend your time together with your cockatiel and train it to mimic a sound. This training also work for other animals such as rabbit. If you turn off the light, any bird inside a cage will get agitated and anxious seeing the unknown setting in front of them. Hence, they will flap frantically and can result in death. To prevent it, cover the cage every night that is not too thick to calm your cockatiel. If not, move the cage to a lighted room. For first training, do not wear jewelry to avoid it pecking on you. Moreover, the jewelry can become distraction that prevents your cockatiel to play with you or focus on training. When they get used to seeing flashy objects only then you can wear jewelry around it. Keeping any pet does need patience, but the effort, nonetheless is always worth it.